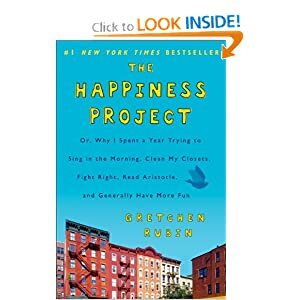 Currently, I'm reading The Happiness Project by Gretchen Rubin. Have any of you read it? Read it if you get a chance. It will make you laugh -- and think. Even though Gretchen is a Yale trained lawyer (whoa! ), she is also a pretty ordinary wife with two little girls. One day she came to the realization that even though "the days were long -- the years were short" and she was not really enjoying her daily life as much as she thought she should! You too?? After tons and tons of some pretty highbrow (and some lowbrow) reading, she embarked on a year-long "project" to find more happiness in her daily life. I won't give away her many many insights (told in a very readable style), but I will share one interesting concept relating to money that you might find useful from Chapter 7. Here's what she has to say, When I began to pay attention to people's relationship to money, I recognized two different approaches to buying: 'underbuying' and 'overbuying.' I am an underbuyer, I delay making purchases or buy as little as possible. . .I often consider buying an item, then decide, 'I'll get this some other time' or 'Maybe we don't really need this.' As an underbuyer, I often feel stressed because I don't have the things I need. I make a lot of late-night runs to the drugstore. I'm surrounded with things that are shabby, don't really work, or aren't exactly suitable. She goes on to say, I gaze in wonder at the antics of my overbuyer friends. Overbuyers often lay in huge supplies of slow-use things like shampoo or cough medicine. They make a lot of purchases before they go on a trip or celebrate a holiday. They throw things away -- milk, medicine, even cans of soup -- because they've hit their expiration date. Like me, overbuyers feel stressed. They're oppressed by the . . . the clutter and waste often created by their overbuying. Gretchen eventually recognizes that there must be a happy medium and that it probably lives more in the camp of the Overbuyer: I knew that I'd be happier if I made a mindful effort to thwart my underbuying impulse and instead worked to buy what I needed. For instance, I ended my just-in-time policy for restocking toilet paper. . .As Samuel Johnson remarked, 'To live in perpetual want of little things is a state, not indeed of torture, but of constant vexation. . . I realized that the paradoxical consequence of being an underbuyer was that I had to shop MORE OFTEN, while buying extras meant fewer trips to the cash register. I bought batteries, Band-Aids, lightbulbs, diapers -- things I knew we would need eventually. Do you recognize yourself in any of this?? Are you an Overbuyer or an Underbuyer?? 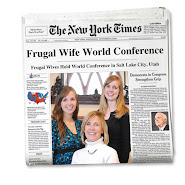 I have been a life-long sad, sniveling underbuyer -- just ask my girls. Constantly out of vacuum bags, light bulbs, tooth paste, pepperoni, chocolate chips (well, I might be short of this last one for a very different reason than not buying them). And the list goes on and on. On the other hand, living in a galaxy far far away, I have a lovely friend who is a very wise Overbuyer. She keeps an entire box of paper (filled with a dozen reams!) nestled safely near her printer. She purchases charming birthday cards 20-30 at a time and even has ten spare deodorants in her bathroom closet! She is prepared, prepared, prepared -- and smells good too! I've always wanted to be like her, but could never quite figure out before what the difference was between us. Mystery solved. I'd love to hear how you buy and if it really makes you happy. I read this book and thought the underbuyer/overbuyer part was very interesting. I'm definitely an underbuyer!! But now that I recognize that about myself, I try to buy a little extra that I normally would, so we have at least one spare for our toiletry items. I'm totally an overbuyer. But without the part where I end up wasting or throwing things out because it expired. But the storage space is an issue for sure. I'd like to think I'm an overbuyer but not too extreme. Fairly close to a happy medium. And I'd say it makes me happy. I HATE running out of something I need. And it rarely happens. I often already have what I need, and because I didn't have to buy it in "crisis mode" I usually got to buy it on a great sale. It's one of the reasons I love Costco. Sometimes I want to buy things there even if they're not a screamin' deal just so I can buy it once and forget about it for awhile. I cannot comprehend how some people can spend the mental effort to keep buying things like toilet paper every time they go to the grocery store. Just keeping up with our non-stockpilable things like milk drives me crazy!!! I like that when I buy a lot of something at once, my lists are shorter and I make fewer trips to go buy something. Like G, I tend to lean towards overbuying. My pantry is stocked, as well as my medicine cabinet/toiletries, but I don't let items expire. I just prefer to find a good sale, combine it with a coupon, and stock up. I get stressed when I'm underbuying-- like when the milk runs out, or my husband informs me he's out of deodorant or toothpaste-- I usually end up at the store buying more than is on my list. My husband and I have underbuying tendencies that we are slowly overcoming. It really makes sense to grab an extra tube of toothpaste when it is on sale and just replace the "extra" tube when it is time to buy more. I think it will help us not run out mid-week of things to prevent the extra run to the grocery store, and it will save us money if we always buy common items when they are on sale. A few items at a time we are learning this lesson and making changes. My husband and I are both pretty balanced on this issue. We hardly ever have to make an extra trip to the store during the week because of running out of things. However, he does lean slightly towards the underbuyer side by wanting to buy less of something, with the idea that we'll buy more on the next trip. I, on the other hand, lean more towards the overbuyer side by wanting to purchae in bulk so that we can save some money and not have to buy things over and over. I like the satisfaction of saving more money over time, and he likes the satisfaction of seeing the bill of the current trip be lower without bulk items. I'm an under-buyer when it comes to nice clothes and big ticket items. I'm so afraid to spend money on something I might decide I hate after I get it home. I am a huge underbuyer also. I am constantly running out of things. Part of the problem is storage and the other is money since my husband is going to school. We can buy huge amounts of toilet paper whether it is on sale or not and also afford to buy food. I usually run to the store when I am close to out of things. When my husband tells me we are out of something he needs, I always tell him you are suppose to tell when you are almost out. I am an underbuyer when it comes to clothes and house decor. My overbuying is for pantry or tolietry items. It makes me very happy! For years I found it irrisitably romantic when my husband would come home smiling with a surprise bonus check and then take me out to stock up our home. He knows me well. And while some wives may prefer to be swept away on a vacation or to buy clothes, I like to feel secure. Now that $$ is more abundant I just regularly stock up as needed unless I have been super busy and I kind of miss those years. But I will never forget how I would feel when at last my pantry was as full as I wanted it. Is is possible to be both??? Oh dear. I have issues. Like Tara, I'm an underbuyer by circumstance. I think if I could afford to overbuy, I definitely would. I always wish I could just pick up an extra ____ when I'm at the store, but know I can't afford it or will blow my budget if I do. But I hate it. I've been having a slow time of getting foodstorage really going... and it stresses me out every time I think about it. I overbuying (in the sense you're talking about) can be a good thing as far as preparedness goes. I honestly try to find a happy medium. If we're getting low on the shelf of a particular item I make a note to add that item to the shopping list for the next trip. I hate when I find we are completely out of something. Extra trips to the store bug me, but sometimes they are necessary whether I like it or not. If I notice that something we use regularly is on sale I might buy a few extra whether or not it's on my list. That just depends on my budget at that time. I've thought about this post a lot throughout my day. I think I am pretty middle-ground on my buying tendencies. I rarely let things run out, especially non-perishable things, and I like to do some stocking up when I can get a good deal. I'm an underbuyer on big things, but an overbuyer on things I'm SURE we'll end up using (TP, etc.). I hate clutter with a vengeance, and living in DC doesn't give us much storage space, so it works for now. My parents, on the other hand, are definite overbuyers. Since we live so close to them, I'm fairly certain we will be provided with toothpaste and shampoo until the Millennium. Also, thank you again for the book! It arrived yesterday and I can't wait to read it. I just found this blog and I am excited to read it and learn from all of you! I am defenitly and overbuyer! It feels good knowing I have a 3 month supply of pantry food and toiletries (that I may need during my maternity leave this fall).. Sometimes I get really funny looks at the grocery store when I stock up on things that are on sale. I can hear people thinking "who needs to buy that may jars of peanut butter or tomato sauce at one time?" It helps me to not have to go to the store as often, because I unfortanetly do a little unintended spending at almost every shopping trip, so the less trips to the store the better for me!